James Bullough Lansing was born James Martini, 14 January 1902, in Macoupin County, Millwood Township, Illinois. His parents were Henry Martini, born in St. Louis, Missouri, and Grace Erbs Martini, born in Central City, Illinois. The elder Martini was a coal mining engineer, and his work required that the family moved about quite a bit during Lansing’s early years. Lansing was the ninth of fourteen children, one of whom died in infancy. For a short time, Lansing lived with the Bullough family in Litchfield, Illinois. He later took their name when he changed his from Martini to Lansing. 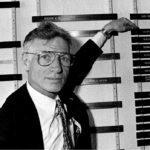 Not much is known about Lansing’s early days, and we are indebted to Bill Martin, one of three surviving brothers, for providing most of the information presented here. Lansing graduated the eighth grade at the Lawrence School in Springfield, Illinois. He also attended Springfield High School. Later, he took courses in a small business college in Springfield. As a young lad he was very interested in all things electrical and mechanical. At about the age of 10, he built a Leyden Jar which he used to play pranks on his playmates. He also constructed crystal sets, and at one time, probably about the age of 12 or so, built a small radio transmitter from scratch. The signals from this set were apparently strong enough to reach the Great Lakes Naval Station in Illinois; naval personnel determined the source of these signals and later supervised the timely dismantling of the young Lansing’s radio transmitter. For a while Lansing worked as an automotive mechanic, specializing in fine engine repair work. He attended an automotive school for mechanics in Detroit through the courtesy of the dealer he worked for in Springfield. Lansing’s mother died 1 November 1924 at the age of 56, and at that time Lansing left home. As best we can determine, he went directly to Salt Lake City. Mrs. Lansing, the former Glenna Peterson of Salt Lake City, tells of meeting Lansing in 1925 in that city. At the time he was working for a radio station as an engineer. In addition, he worked for the Baldwin loudspeaker company in Salt Lake City for a time. He also met his future business partner, Ken Decker, in Salt Lake City. Lansing and Decker moved on to Los Angeles where they set up a business manufacturing loudspeakers to be used primarily in radio sets and consoles. The Lansing Manufacturing Company was registered as a California corporation 9 March 1927. Just prior to this, James Martini changed his name to James Bullough Lansing. We have no idea why he chose the name Lansing, while most of his brothers had simply adopted the name of Martin. Bill Martin came out to join his brother in 1930, and another brother, George, came at a later date. 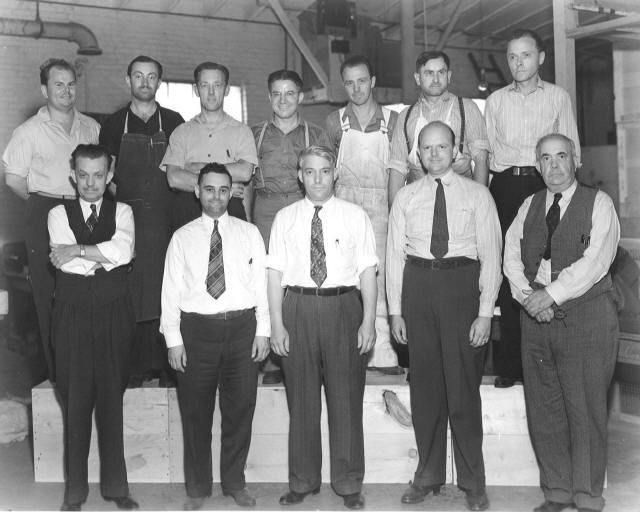 In 1930 there were no more than 40 employees at the Lansing Manufacturing Company. Some of the early products included armature loudspeakers, which are known today only as museum curiosities. Other loudspeaker products made use of traditional field coils as well as early permanent magnets. This was truly a cottage industry. The family would make cones and wind coils at home in the evening, and the parts would be taken in to be assembled the next day. The company experienced hard times during these years of the depression. Most of Lansing’s customers were radio set manufacturers, many of them located in the Midwest. The company’s products were largely eight- and six-inch loudspeakers. What few larger models were made were used only in luxury console radios. The company established its permanent headquarters at 6900 McKinley Avenue in South Los Angeles. In the late twenties, the success of “The Jazz Singer” established sound as the new standard for the motion picture theater. Western Electric, the manufacturing arm of AT&T, was destined to rule that business for many years. The vast resources of Bell Laboratories had been brought to bear on problems of recording, reproducing, and allied arts, and as a result they were able to mount the required technology for manufacturing in fairly short order. Electrical Research Products Incorporated (ERPI) was set up as a distribution company by Western Electric as a means of servicing the motion picture industry. The early Western Electric theater systems were of one-way design consisting of large re-entrant type exponential horns. The Western Electric 555 driver was used with these large assemblies. Frequency response was band limited, and the range covered was probably no more than 100 Hz to about 5,000 Hz. Later on, Western Electric added a high-frequency unit as well as an array of low-frequency woofers to augment these systems. They used Jensen 18-inch woofers in open-back enclosures to supplement low frequencies and a device known as the Bostwick tweeter to extend the upper range. These additions to the basic one-way system appeared in 1931. The sound department at Metro-Goldwyn-Mayer Studios was not happy with the augmented Western Electric systems. Specifically, they objected to the twelve-foot path length in the mid-range and its concomitant time delay relative to the low-frequency and high-frequency sections. The RCA systems of the same era were not even as good as the three-way Western Electric systems; they used a single eight-inch cone transducer mounted on a straight horn. In 1933, Douglas Shearer, head of the MGM sound department, got the idea of building his own system. He enlisted the aid of John Hilliard, a young electrical engineer, and Robert Stephens, a design draftsman, who later was to found the Stephens Trusonic Company. John F. Blackburn, a physics graduate of the California Institute of Technology, suggested to Hilliard that MGM enlist the aid of James B. Lansing to manufacture components for the MGM system. The so-called Shearer horn system was introduced in 1936 and won an award from the Academy of Motion Picture Arts and Sciences for technical excellence. It was a large two-way system that had much in common with an earlier system that had been designed for auditory perspective experiments at Bell Laboratories. The Shearer system used high-frequency multicellular horns driven by a driver with an annular slit phasing plug. The low-frequency section of this system consisted of a large W-horn with fifteen-inch woofers operating in an open back configuration. Both woofers and high-frequency drivers had three-inch voice coils. Flat wire was used in the high-frequency driver and round wire in the woofer voice coils. There is no question that the Shearer MGM system set new standards for sound in the motion picture theater. The basic design was later adopted by many manufacturers around the world; both RCA and Western Electric adopted the basic approach for their later systems. Western Electric objected to the use of annular slits in the high-frequency phasing plug the Lansing company had designed. Western Electric had patented this design, and as a way around this problem John Blackburn and Lansing devised a radial slit phasing plug, which they incorporated in the 284 driver. Later, Blackburn found a way around the Western Electric annular slit patent by noting in the literature that Bell and Tainter, in the early years of the century, had established prior art in the area of acoustical phonograph design. Another important system that Lansing designed for the industry was the Iconic, a small two-way system using a fifteen-inch low-frequency loudspeaker and a small high-frequency driver, the 801 (later known in its Alnico form as the Altec 802), driving a small multicellular horn. The Iconic system gained wide popularity throughout the motion picture industry as a monitor loudspeaker; many two-way monitor systems of today are only minor improvements over this early system. The United States government, taking note that Western Electric held a virtual monopoly in motion picture sound recording, forced that company to divest itself of all holdings in the sound recording business. Western Electric signed a consent decree in 1938 and sold the holdings of Electrical Research Products, Incorporated, to a group of engineers who were working for them at the time. The name, Altec, was coined for this occasion: Altec, a contraction of All Technical. The principals of this new company were George Carrington and E. L. Conrow. Their new company was called Altec Service Corporation and maintained contracts with theater chains around the country for system maintenance work. The Altec Service Corporation went about its business for two years without a source of new stock or parts. They used existing stocks of ERPI products where required, but their main business was service. It became apparent to Carrington and Conrow that they would have to develop a source for new manufactured items if they were to be a viable force in the business on a long-term basis. In 1939, Ken Decker, Lansing’s business partner and a reserve officer with the United States Army Air Force, was killed on maneuvers when the airplane he was piloting crashed. Without Decker, Lansing’s business suffered, and it became apparent in 1941 that the sale of the company was the only way to keep it afloat. On 4 December 1941, the Altec Service Corporation bought the Lansing Manufacturing Company. They were reputed to have paid a price of $50,000 for the acquisition, and there were nineteen employees at the Lansing Manufacturing Company at that time. Lansing assumed the title of Vice-President of Engineering in the new Altec Lansing Corporation. Western Electric agreed to license the Altec Lansing Corporation to manufacture any and all of the proprietary designs that were covered by the consent decree. Royalties were never charged by Western Electric for items manufactured. With the new stability offered by the merger, Lansing was at last free to pursue his work without financial worry. During these years, he perfected many of the processes that have become standard in loudspeaker manufacturing around the world, including high-speed winding of flat wire voice coils on metal mandrels and hydraulic forming of high-frequency aluminum diaphragms. We should take note of two very famous systems that Lansing perfected in these years with Altec. The 604 coaxial loudspeaker of 1943 was a very successful combination of a small multicellular horn mounted concentrically with a 15-inch woofer. Working with John Hilliard, Lansing developed the A-4 theater system, a large two-way system standing about 8 feet high, which made use, for the first time in theater systems, of a low-frequency enclosure that was not open in the rear. The combination of horn loading through the mid-bass region and porting in the low-frequency range gave the system a level of low-frequency performance in the theater that had been unknown before. 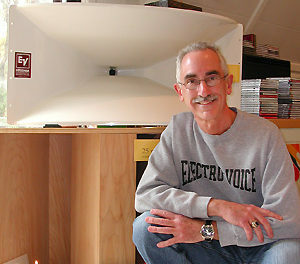 The high frequency section made use of a traditional high-frequency annular slit phasing plug driver with a three-inch voice coil, the model 288. The low-frequency transducer in the A-4 theater system was the model 515 loudspeaker, a fifteen-inch loudspeaker with a three-inch voice coil. It was the first low-frequency transducer to make use of flat wire. These early systems used field coil structures for attaining high flux levels in the transducers, since the permanent magnet materials of the day were not strong enough to provide the necessary field strength for these systems. During the war years the Altec Lansing Corporation worked on a magnetic airborne detector, an airborne submarine detection system of extreme sensitivity. George Carrington was quick to note that the high energy magnetic material, Alnico V, used in this device would have great application after the war in loudspeaker designs. During the war years, Lansing’s energies and talents were channeled solely into transducer and systems engineering. In 1941, when the Altec Service Corporation bought the assets, goodwill and trade names of the Lansing Manufacturing Company, Lansing agreed that he would not go into business for himself for a period of at least five years. While there were continuing disagreements between Lansing and Carrington, Lansing did honor this commitment and in 1946, five years after the acquisition, he left Altec Lansing to form a new company. Everyone at Altec Lansing wished him well; they had known that he would eventually leave after the five-year commitment had been met. The company that is presently known as James B. Lansing Sound, Incorporated was first called Lansing Sound, Incorporated, and dates from 1 October 1946. The principals of this company were James B. Lansing, Chauncey Snow, and Chester L. Noble. Since the name Lansing had been identified for so many years as a product trade name, the Altec Lansing Corporation objected strenuously to the name of the new corporation. By agreement with George Carrington, Lansing Sound, Incorporated, changed its name to James B. Lansing Sound, Incorporated. The general consensus was that there was strong product and brand identification with the name of Lansing by itself, and that of course was the property of Altec Lansing. The use of the full name James B. Lansing on the other hand focused attention on the man himself –as opposed to specific products. The earliest letterhead of the new company showed the office located at 510 South Spring Street in Los Angeles, which was the office of Chester Noble, a financial consultant. Snow was a lawyer Lansing had dealt with for some years. The letterhead also indicated that the factory was located in San Marcos, a small town close to Oceanside in San Diego county, and the location of an avocado and citrus ranch that Lansing owned. He maintained a complete machine shop on the premises, and this is where he actually began his new loudspeaker manufacturing work. One of the first products introduced by the new company was the model D101 fifteen-inch loudspeaker. It was virtually a copy of the Altec Lansing 515 theater woofer with an aluminum dome and with venting through the back of the magnet structure. Lansing also used the trade name, Iconic, in describing this loudspeaker, and this was of course an obvious violation of Altec Lansing’s ownership of the Iconic trade name. Obviously, Lansing was not aware that he was doing anything wrong; he simply felt the name Iconic which he had coined as a trademark years earlier was somehow still his. Altec Lansing of course insisted that he cease and desist in such unwarranted use of the Iconic name. Lansing soon developed a series of components enabling him to put together a virtual copy of the original Iconic system. These included a fifteen-inch theater-type woofer, a high-frequency driver, and a small multicellular horn. The driver, known as the D175, is still in the JBL catalog today. Lansing pioneered the use of four-inch voice coils for low-frequency transducers, and the D130 was the first loudspeaker to incorporate this. The D130 was developed in 1947 and with it the D101 was discontinued. The development of Alnico V material during the war years is what made the new design possible. Working with Robert Arnold of the Arnold Engineering Company in Chicago, Lansing was able to procure a magnet of reasonable size that could saturate a four-inch diameter gap with a field strength of about 12,000 gauss. Such a gap obviously had to be quite small, and the relatively large four-inch voice coil had to be built with a degree of precision that had been unknown in the industry. Other products designed by Lansing during the same time were the twelve-inch D131 and eight-inch D208. The company had been formed during the economic slump immediately following World War II. As we have noted before, Lansing was not a shrewd businessman, and the company never prospered under his direction. In November of 1947, Lansing secured additional funding from Roy Marquardt of the Marquardt Aviation Company. Company was represented on the Board of Directors by William H. Thomas, who was at that time the Treasurer of Marquardt. The company moved its offices and manufacturing facilities to the Marquardt plant at 4221 Lincoln Boulevard in Venice, California. In late 1948, the company moved to the Marquardt facility at 7801 Hayvenhurst Avenue in Van Nuys, California. At the end of its second fiscal year in 1948, James B. Lansing Sound, Incorporated, showed an operating loss of some $2,500; and this with most of the tooling and development costs still in the process of being capitalized. By December of 1948, the debt to the Marquardt Aircraft Company had reached almost $15,000, and it was inevitable that the company would have to be taken over by Marquardt with Lansing continuing on as an employee. Lansing further bought out the interest held by Messrs. Snow and Noble so that he became the sole spokesman for the company in negotiations with Marquardt. In early 1949, Marquardt was purchased by the General Tire Company, who were not interested in continuing the relation with Lansing. The tie between Marquardt and Lansing was severed, and at that point, William Thomas left Marquardt and assumed an important role in the operation of James B. Lansing Sound, Incorporated. The company then moved to new headquarters at 2439 Fletcher Drive in Los Angeles. During the first three years James B. Lansing Sound, Incorporated made no profit at all; it barely stayed afloat. Over the short span of three years, the company occupied four locations, and that had an impact on production efficiencies. There were rarely enough funds to pay all suppliers. By late 1949 the company had amassed a total debt of some $20,000. One supplier who was very sympathetic to Lansing and his work was Robert Arnold, whom we referred to earlier. It may be said that it is through the sufferance of Arnold that JBL is in existence today. At one time, James B. Lansing Sound, Incorporated, had an indebtedness to Arnold Engineering Company stretching over a period of two years. We are not sure why Arnold provided this extra measure of lenience to Lansing, but it may have had to do with the fact that Lansing was an avid promoter of Alnico V magnet material for loudspeaker use. Lansing’s endorsement of the new material would ensure its general acceptance by the rest of the industry. On Thursday, September 24th, 1949, at the age of 47, James B. Lansing passed away. He had been wise enough to secure a life insurance policy in the name of his company during the late forties. The policy was for $10,000, and it was the payment of this policy on his death that helped William Thomas secure the future of the company. We must remember that $10,000 was a great deal of money in 1949. When Lansing died he left his one-third share of the company to his wife. During the early fifties, Thomas negotiated the purchase of this amount from Mrs. Lansing and thus became the sole owner of James B. Lansing Sound, Incorporated. During the late forties and early fifties, the value of the name Lansing as a trade identification was extremely high. Although it strictly belonged to the Altec Lansing Corporation, the new company made use of the name Lansing in the style of Jim Lansing “Signature” loudspeakers. The use of the word Signature implied that one could not take a man’s name away from him, even though the name had been given or sold previously as a commodity in a business transaction. Up to about 1955, the James B. Lansing Sound Company sold loudspeakers with the identification “Jim Lansing Signature Sound” emblazoned boldly on the pot structures. The company was quite small at that time, but by the mid-fifties it had become apparent that the new company was here to stay and was becoming a more significant force in the marketplace. At that time, Carrington was pressed by many of his field people to do something about this flagrant use of the name Lansing by the new company. George Carrington and Alvis Ward of Altec then entered a long round of polite out-of-court negotiations with Thomas, and they agreed that the new company would cease and desist in labeling of the product as Lansing. Early in his stewardship of the company, William Thomas made a commitment to design excellence and engineering integrity. These have been apparent over the years in innovative designs in both technical and visual aspects. In 1957, JBL departed from the standard method of making pot structures using sections of seamless steel tubing. They introduced sand cast pot structures made of ductile iron. This simple change decreased manufacturing costs and raised the flux density in the gap by approximately 25%. As the consumer high fidelity movement got under way in the early and mid-fifties, Thomas secured the services of industrial designer Robert Hartsfield and together they created the Hartsfield system (which was still built in Japan as late as the mid eighties). In 1954, Thomas introduced an Alnico V version of the Western Electric 594 high-frequency driver, a four-inch diaphragm compression driver whose basic design dated back to the early thirties. The basic design had not been available for some twenty years or so. The new driver was dubbed the 375, and it immediately put JBL into the theater business. Contracts with both the Ampex Corporation and Westrex, the export division of Western Electric, brought forth a number of ancillary developments in the design of acoustic lenses and radial horns for theater use. One of the most striking consumer high-fidelity designs of the period was the “Paragon.” The acoustical concept was that of Richard Ranger, a colonel in the Signal Corps who had earlier been responsible for many innovations in motion picture sound engineering. The striking design of the Paragon remained a viable acoustical design for about a quarter century after its introduction in 1957. Arnold Wolf of Berkeley, California, took credit for the stunning industrial design of the product. The work done during the mid-fifties on theater systems provided the basis for a major thrust into the professional sound business in general. The first area to be pursued by the company was that of studio monitor systems. During the early 1960’s, JBL worked closely with Capitol Records to design a basic monitor system, the 4320, which put JBL into the monitor business in a big way. Through Capitol Records’ International connections, JBL became the standard monitor of the worldwide Electrical and Musical Industries Company (EMI) of England. These early designs and extensions of the basic technology made JBL a leading supplier of monitors worldwide. The coming of age of rock ‘n’ roll music during the sixties underscored the need for heavy-duty transducers that could take the mighty abuse given them during concerts. The basic Lansing design, the D130, became the signal example of what could be done in this area. It was Leo Fender of the Fender Guitar Company who identified the D130 as the ideal loudspeaker for his electric guitar designs. Through a contract with Fender, JBL provided a specialized version of this loudspeaker for that company. Subsequently, JBL has manufactured a number of other designs from ten-inch models all the way up to eighteen-inch models targeted for the music performer. The professional line as we know it today took form in the late sixties, and it was a largely consolidation of previous OEM work that had been done for various companies, such as: Ampex, Westrex, General Railway Signal, and Fender. Thus, in a relatively short period of time, JBL came up with a full-blown line of products to serve many segments of the professional market. In 1969, Thomas sold JBL to Sidney Harman of the Jervis Corporation. Under the stewardship of Harman, the company grew from a relatively modest $8M gross business per year to about $60M. In early 1977, Sidney Harman sold JBL, along with his other holdings in the high-fidelity industry, to Beatrice Foods. Three and a half years later Harman re-acquired JBL, and the company continues as a major force in both consumer high-fidelity and professional markets. JBL is the leading producer of branded loudspeakers in the United States today. The company is also a significant force overseas, with more than half of the output of the company sold in export markets. Lansing was not an outgoing family man. He had four children whom he cared for a great deal. He would spend occasional weekends entertaining them, taking them to the park, and so forth. But for the most part, he spent relatively little time at home; typically, weekends would be spent at the factory where he would work on new projects and processes. In the old McKinley Avenue plant, the only sofa was in the ladies lounge. After long hours of agonizing over a process or a new invention, Lansing would often go to sleep on the sofa on Sunday night –only to be discovered the following Monday morning when the first secretary came in—usually with a shriek! From his earliest days, Lansing was driven by a desire to make things the best way he could possibly envision. He was not limited by his lack of formal education and over the years had developed many skills. He had acquired a knowledge of differential and integral calculus, and he could perform the basic calculations in horn design, dividing network design, and the like. He probably understood magnetic theory as well as any loudspeaker designer of his day did. Just as important were his skills in manufacturing and his understanding of basic manufacturing and tooling processes. 1902: James B Lansing born in Illinois. 1927: Lansing Manufacturing Company founded in Los Angeles. 1934: Douglas Shearer of MGM heads team which designs first practical loudspeaker system for motion picture use. Lansing builds components for the system. 1937: Shearer system awarded citation by the Academy of Motion Picture Arts and sciences. 1941: Lansing Manufacturing Company acquired by Altec Service Company. 1943: Lansing develops improved manufacturing methods, including flat wire milling and high-speed winding of ribbon wire voice coils. 1943: Lansing designs the 604 Duplex loudspeaker. 1944: Lansing and Hilliard redefine the state of the art for the motion picture theater with the A-4, dubbed Voice of the Theatre. 1946: Lansing founds a new company, James B. Lansing Sound, Incorporated, to pursue new directions in transducer and sound system design. 1947: JBL introduces the D-130 15-inch loudspeaker, which was the first known use of a 4-inch flat wire voice coil in a cone transducer. 1949: James. B. Lansing dies; William Thomas becomes company president. 1954: JBL introduces the model 375 high-frequency compression driver. This was the first commercially available 4-inch diaphragm driver and afforded flat response to 9 kHz. 1954: Introduction of a family of acoustic lenses, developed by Locanthi. 1954: Model 075 high-efficiency, high-frequency ring radiator introduced. 1955: Leo Fender of musical instrument fame incorporates the model D-130 into his famous guitar amplifiers, signaling JBL’s entry into the music reinforcement field. 1958: Debut of the Paragon stereophonic loudspeaker system, incorporating a cylindrical reflecting principle for superior stereophonic imaging in the home. 1962: Introduction of the first two-way studio monitor using a high-frequency compression driver with acoustical lens. 1965: “T-circuit” output configuration for high performance solid state amplifiers. 1968: 4310-three-way bookshelf monitor. This system -lives on through the models 4311 and 4312. 1969: Sidney Harman acquires JBL from William Thomas. The company embarks on a period of accelerated international growth through the Harman distribution companies. 1969: The L-100, a consumer version of the 4311, is introduced, eventually reaching sales of 125,000 pairs during the decade of the seventies. 1969: JBL transducers power Woodstock and other major rock festivals. 1973: Epanded line of 4300-series monitors, including the industry’s first four-way designs. 1975: Model 4682 “Strongbox” line array. 1976: JBL monitors rank first in the US recording industry survey conducted by Billboard. 1977: Company moves to new location in Northridge, California. 1979: Patented diamond surround diaphragm technology for high frequency resonance control. 1979: Development of SFG (Symetrical Field Geometry) magnet structures. 1980: Patented Bi-Radial Constant-Coverage horn technology. 1981: Bi-Radial monitors introduced. Building on the acoustical concept of flat power response, the 4400-series monitors quickly gain acceptance by the recording industry. 1981: L250 four-way consumer system introduced. 1982: Titanium introduced as a diaphragm material in compression drivers. 1983: The model 4660 defined coverage system. Based on Bi-Radial technology, the system provides tailored coverage for speech application in rectangular spaces. 1984: Titanium dome tweeters are introduced into consumer products, providing superlative response to 27 kHz. 1984: UREI acquired by JBL, bringing electronics design and manufacturing expertise to JBL’s traditional line of loudspeaker components. 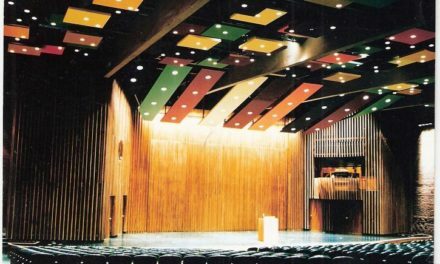 1984: The Academy of Motion Picture Arts and Sciences selects JBL components for the new system in the Samuel Goldwyn Theater. 1985: The Everest DD 55000 system is selected by Japan’s Stereo Sound as Product of the Year. 1986: First Control Series multi-purpose molded enclosure loudspeakers. 1988: JBL acquires the British Soundcraft line of recording consoles for recording and reinforcement applications. 1989: The Directors’ Guild of America selects JBL components for the systems in its Hollywood headquarters building. 1990: Patented VGC (Vented Gap Cooling) for raising the thermal power limits of low frequency transducers. 1991: K-2 loudspeaker system selected by Japan’s Stereo Sound as Product of the Year. 1991: First pro audio neodymium woofer debuts in JBL Array Series. 1992: New lower midrange compression driver with matching horns. 1993: “Rapid flare” low distortion compression driver and matching family of horns. 1995: EON powered loudspeaker with multiple patented design technologies. 1995: First-ever patented dual coil neodymium Differential Drive loudspeaker for pro sound reinforcement. 1996: HLA Series with patented Space Frame array element design, multi-band waveguide and composite subwoofer enclosure introduced. 1999: JBL is the official “Sound of Woodstock.” First in 1969, then in 1994 and again in 1999. 2000: Announces VerTec line array system, which debuts at the Democratic National Convention. 2000: EVO intelligent loudspeaker system with DSP self-control. 2001: VerTec used for Presidential Inauguration, Washington, D.C., for a crowd of 300,000 persons. 2002: VerTec used for major special events including the Super Bowl, the Grammy Awards and the World Cup Opening Ceremony (Seoul, Korea). 2002: JBL’s John Eargle, Mark Engebretsen and Don Keele receive a Scientific/Technical Award from the Academy of Motion Picture Arts and Science honoring their development of cinema loudspeaker systems using constant directivity horns and vented-box low frequency enclosures, first embodied in the JBL 4675. 2002: JBL’s Bernard Werner and William Gelow receive a Technical Achievement Award for “the engineering and design of filtered line arrays and screen spreading compensation as applied to motion picture speaker systems” as employed in JBL ScreenArray cinema loudspeaker. Find out much more about James B. Lansing, as well as Lansing Manufacturing, Altec Lansing, and JBL, at the Lansing Heritage website.